A simple yet tasty Christmas treat. Preheat the oven to 140°C/gas mark 1. Line a baking tray with non-stick baking paper. Put the coconut and ground almonds in a bowl and mix together. Add the maple syrup, melted coconut oil and vanilla extract. Mix the ingredients together until all the coconut is covered and the mix comes together. Using your hands, create compact balls about the size of a golf ball and put them on the lined tray. Bake in the oven for 10 minutes, then remove and turn the tray around. Bake for a further 10 minutes. Allow to cool on the tray for 10 minutes before transferring to a wire rack to cool. Meanwhile, melt the chocolate in a heatproof bowl set over a pan of simmering water or in the microwave. Now for the fun bit! 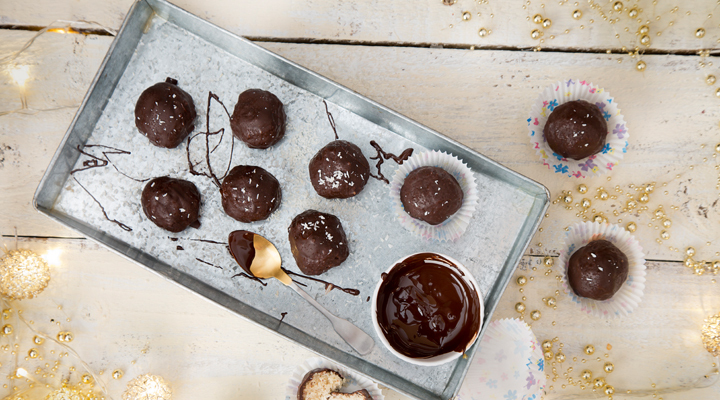 Dunk the coconut balls in the melted chocolate until they are fully coated. Fish them out using two spoons and put back on the lined tray to set.